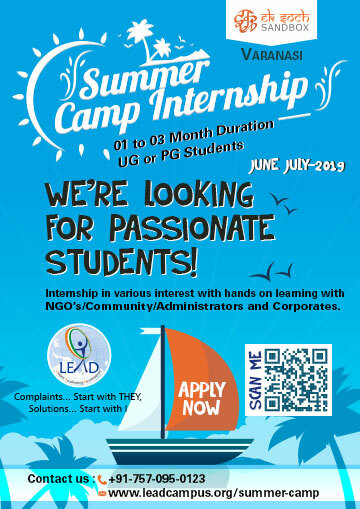 LEAD Summer Camp Internship: This Summer, we encourage even non professional courses students of UG and PG to engage themselves to go for the internship. Utilize your valuable time to gain the strength and work upon your weakness, which will directly or indirectly going to help you in your career and overall personality development. Personality development is not the things which you get in classrooms or reading only texts. It's the exposure of society and surroundings from which you acquire the most of the skills and confidence. The Holy City Kashi (Varanasi) calling you for the change in you and society. An opportunity to volunteer and spend quality time to explore Kashi and its surroundings, learn with culture and develop your hidden potentials with LEAD Summer Internship. So Grab this endless opportunity of learning, Apply for this Summer Internship. We are offering internship to professional and non-professional courses students from any part of India. Focus and medium of Internship: Hands on learning, team work/building, motivation, creative thinking, problem solving, project and action planning, action on plan. Nature of Internship: Field work, Classroom learning, Workshops, Exposure/work with Industry/NGO/Community/Local Administration and with the major focus on experiential learning and self development.